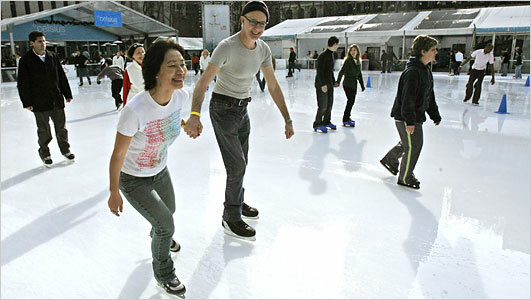 Ice skating is a fun tradition for individuals and families during the holiday season. Many of our local ice rinks open up the ice for extended public skating times. Some even offer mini camps to help you learn some tips to be a better skater. Allen Community Ice Rink – 200 East Stacy Road, Allen, Texas 75002. Public skating cost $5.00 admission, $3.00 skate rental. For more information, please call 972.912.1097 or visit the Allen Community Ice Rink website. Learn to skate this holiday break with our festive ice skating program. Participants receive 30 minutes of instruction followed by an hour and a half open skate. Skate rental and open skate sessions are included. For ages 3 “ 14 years old. December 27 and 29 from 12:30 – 2:30. Cost is $30. Hockey Camp – The Allen Community Ice Rink is holding a Jr. Americans Holiday Hockey Camp this December! This three day camp will include 60 minutes of skill instruction and 30 minutes of small area games and is open to all Mite, Squirt and Pee Wee youth hockey players. December 27-29 from 5:30 – 7:00 pm. Cost is $99. New Year’s Eve Lock In – December 31, 6:30 p.m. – 8:30 a.m., Grades 3-6. The New Years Eve Lock-In is the place to be for your 3 – 6 graders! Participants will experience an Allen Americans Games, Player Autographs/Pictures, Open Skate, Broomball, Board Gaems, Movies, Pizza, Hotdogs, and many other exciting on and off ice games throughout the night. Cost is $85. Galleria Ice Skating Center – 13350 Dallas Parkway in the Dallas Galleria. Admission $9.00, skate rental $3.00. For more information, please call (972) 392-3361 or visit the Galleria Ice Skating Center website. Ice at The Parks – 3815 S. Cooper Street, Arlington, Tx 76015. For more information, please call 817-419-0095 or visit the Ice at The Parks website. Polar Ice House, Grapevine Mills Mall, Grapevine – 3000 Grapevine Mills Parkway #613, Grapevine Mills Mall, Entry 6, Grapevine, Texas 76051. For more information, please call 972-874-1930 or visit the Polar Ice House website or follow Polar Ice Facebook. The Ice at Stonebriar Mall, Frisco – The Ice at Stonebriar Centre is located inside the Stonebriar Centre in Frisco, Texas. Stonebriar Centre is located at 2601 Preston Road, Frisco, TX 75034. Skate all day for $13, includes skate rental. For more information, please visit the Ice at Stonebriar website or follow Ice at Stonebriar on Facebook. Santa’s Little Elves Camp – Hourly Play Care and Skating Class. Go shopping and let us teach your little one how to skate! Drop in per hour and give your child the gift of skating while you get a few gifts for under the tree. Daily December 26th – 30th, 11:30am – 4:00pm, $20.00 per hour. Skate rental, instruction and fun time included! Reserve a time slot today. Only 10 children will be accepted per hour.